All art exhibits must be approved by the Ernst Gallery Exhibition Committee. For more information, please email Mary Higgins at mhiggins@nvcc.edu. After receiving approval, the art exhibit will be booked with the Cultural Center. Gallery hours are Monday - Friday, 8:30 a.m. - 4:30 p.m. and Wednesdays from 8:30 a.m. - 10:00 p.m.. The gallery also serve as the theater lobby and is open without supervision during theater performances. There is limited storage space for the gallery; therefore all work must be removed from the gallery promptly at the end of each exhibition. Artwork designed to be exhibited on a wall must be able to be displayed from a hanging rail. Nothing may be affixed directly to, on or through the wall. 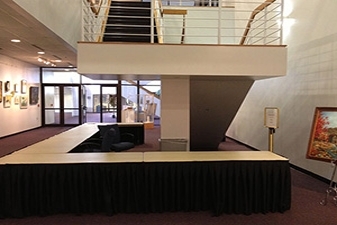 If needed, the exhibitor must furnish pedestals and plinths for 3-D work. 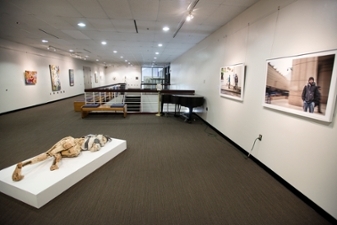 The Ernst Community Cultural Center requires a minimum three-hour booking. Additional charges apply for use of equipment, an administrative fee, parking and labor. A separate cleaning fee of $180 applies if the kitchen is rented. 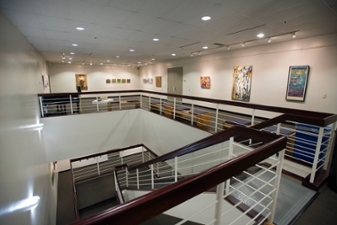 For information on Exhibition pricing, please email Catherine Aselford at caselford@nvcc.edu.